Dutch elm disease (DED) is a lethal vascular wilt disease of American elm (Ulmus americana) that is caused by Ophiostoma novo-ulmi and O. ulmi. While once widespread in the region, O. ulmi has been displaced by the more aggressive O. novo-ulmi and is now believed to be uncommon to rare in the region. Both O. novo-ulmi and O. ulmi are non-native to North America and Europe. Overland spread of DED from diseased to healthy elms is facilitated by the native elm bark beetle (Hylurgopinus rufipes) and European elm bark beetle (Scolytus multistriatus). The disease also spreads from diseased to healthy trees through root grafts when elms are in close proximity to one another. All North American elms are susceptible to DED to some degree. 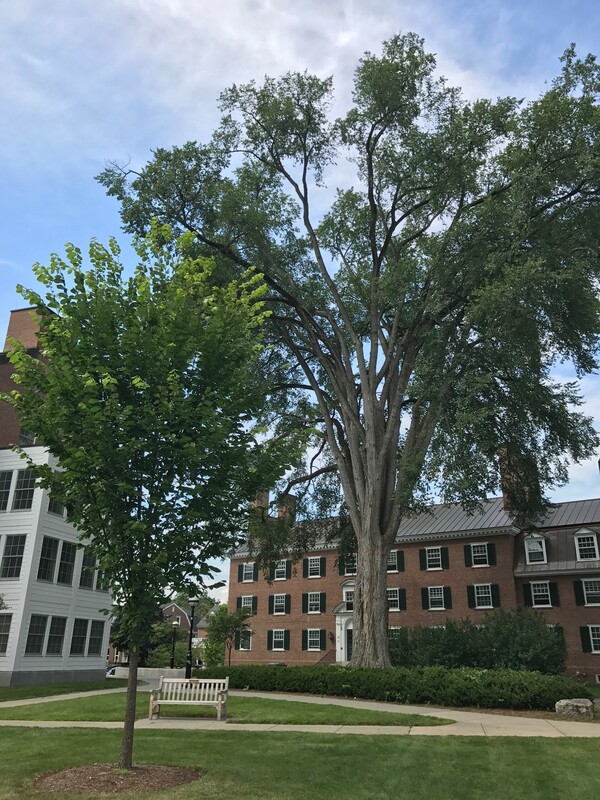 American elm, the most abundant elm species in New England, is highly susceptible while the two other native elms occasionally found in landscape settings, rock elm (U. thomasii) and slippery elm (U. rubra), vary from susceptible to somewhat resistant. Several DED-resistant cultivars of American elm have been developed, with Princeton (U. americana ′Princeton′) and Valley Forge (U. americana ′Valley Forge′) the most abundant in area nurseries. While both cultivars offer good to excellent resistance to DED, they both suffer from poor canopy structure and are prone to stem and branch breakage under high winds and snow. Additional cultivars that are not as widely available, but offer more desirable canopy structure and form, include Jefferson (U. americana ′Jefferson′) and New Harmony (U. americana ′New Harmony′). Many European elms are also highly susceptible, such as English elm (U. procera) and smoothleaf elm (U. minor). Japanese (U. davidiana var. japonica) and Chinese elm (U. parvifolia) are highly resistant and rarely succumb to the disease in the landscape. Symptoms of DED, when transmitted by elm bark beetles, first appear on scattered upper canopy branches as wilting and yellowing leaves, a symptom often referred to as “flagging”. Usually, soon after one branch becomes symptomatic, adjacent branches also show symptoms, followed by major canopy dieback. Drought stress can intensify symptom development. When the bark is peeled or cut on affected branches, longitudinal, brown-colored bands or streaks in the outer rings of the sapwood are visible. This symptom is referred to as vascular staining and it’s the most distinctive symptom of DED that can be observed in the field. Care must be taken to search for vascular staining immediately after the bark is cut or peeled, as sugars in the outer sapwood can oxidize when exposed, turning healthy tissues brown. Flagging alone is not sufficient to diagnose DED, as elm anthracnose, branch cankering, drought, among other stresses, can also lead to the development of flagging symptoms in the upper canopy. Therefore, it is important to have DED confirmed prior to intervention. The overland spread of DED depends on the activity of its insect vectors, the native and European elm bark beetles. Elm bark beetles breed under the bark of dying or dead elms. When their eggs hatch, the larvae feed on inner bark and sapwood, forming a network of galleries in the wood. 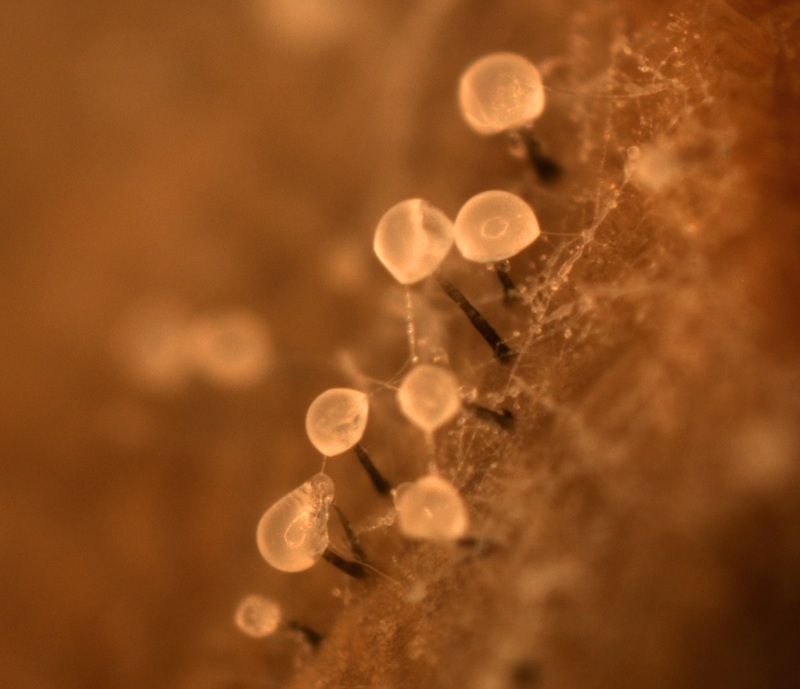 Ophiostoma develops fruiting structures topped with sticky spore masses in the beetle galleries of infected elms. The spores then coat the bodies of adult beetles as they emerge from diseased trees or cut logs. As active adults, the native elm bark beetle chews through the bark of healthy elm branches and the main trunk to feed on the inner bark or to create overwintering sites. The adults of the European elm bark beetle feed in twig crotches in the upper canopy of healthy elms. Both beetles carry fungal spores into or near severed xylem vessels as they feed, where the spores germinate and infect the water-conducting tissues. The second mode of infection from an infected tree to an adjacent healthy tree is via root grafts. Water conducted through the connected root systems carries Ophiostoma spores along with it. Once Ophiostoma is introduced into the roots of the healthy elm, it slowly moves within the vascular system to the upper canopy. 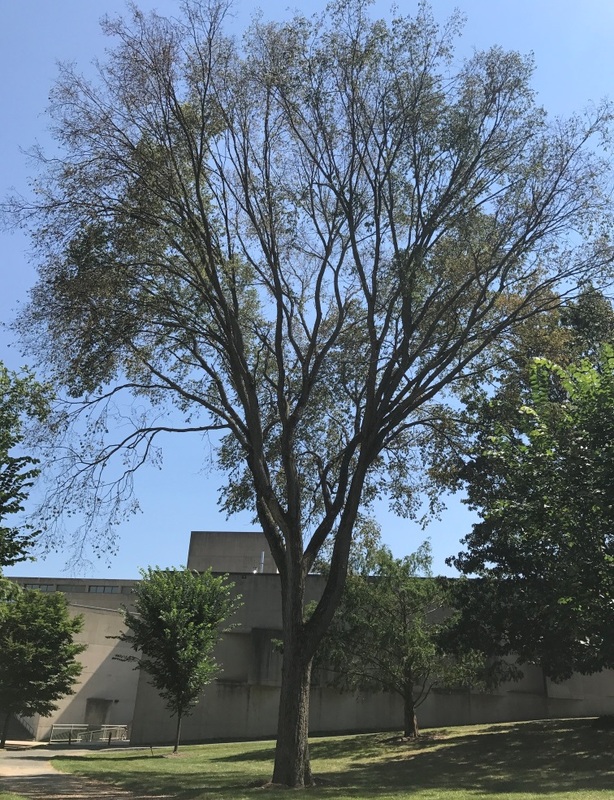 DED may progress rapidly, killing infected elm during the same season after infection or it may gradually cause branch dieback over several years in elms that exhibit some level of resistance. Regularly scout elms for flagging branches in the upper canopy, especially from mid-June onward during the growing season. When flagging is observed, immediately prune symptomatic branches and check for vascular staining. If vascular staining is observed, have DED confirmed by a diagnostic laboratory. 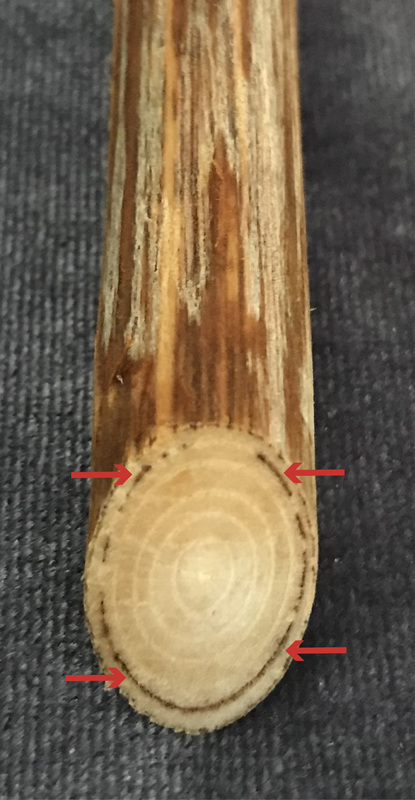 To ensure the pathogen has been successfully excised, prune the flagging branch so that 8–10 feet of symptomless sapwood exists between the portion of the branch with wilt symptoms and the cut that removed the branch (if possible). Protect American elms from infection with preventative fungicide injections at 1–2 year intervals. Fungicides labeled for use against DED include Arbortect 20S (thiabendazole hypophosphite), Alamo (Propiconazole) and Tebuject (Tebuconazole). Therapeutic injections can also be performed in combination with excision of diseased branches. For therapeutic injections, Alamo is recommended. Ensure that repeated injections are not resulting in injury to the tree. Remove declining elms and chip or debark all debris that is more than 1 inch in diameter. Sanitation activities like this reduce inoculum and remove elm bark beetle brood sites, which slows the spread of DED. If dying elms are left standing, they become major breeding sites for elm bark beetles, increasing the likelihood that nearby elms will become infected. Protect vulnerable elms against insect pests (e.g. gypsy moth, Japanese beetle and elm leaf beetle) and opportunistic pathogens to maintain high vigor. Establish a large mulch ring around mature elms to avoid mower and string trimmer injury to lateral roots and the base of the trunk. Provide young American elms with supplemental water during extended dry periods to avoid development of drought stress.